Let’s face it, whether you have three kids or twelve, as moms we all need grace and an easy button to press from time-to-time (okay, daily!). I love having freezer meals and no-brainer items on hand for convenience. That’s why as a family of nine, almost ten, I’ve found getting in large family freezer cooking days a huge life saver. In the past, I’ve done many 4-hour freezer cooking sessions that didn’t so much focus on dinners, but easy items to help me feed my growing family and get meals on the table. I focused on making simple breakfast and lunch items in bulk. This includes items like french toast, ham & egg cups, pancakes, muffins, various loaves of bread, burritos, and peanut butter & jelly sandwiches. Don’t fuss at me about healthy. 🙂 Food is food, and any help for momma is help for momma (amen); just add-on fruit, yogurt, or 10 lbs of pre-made carrot sticks as able. Other side item ideas are cheese sticks, smoothies, or hard boiled eggs. 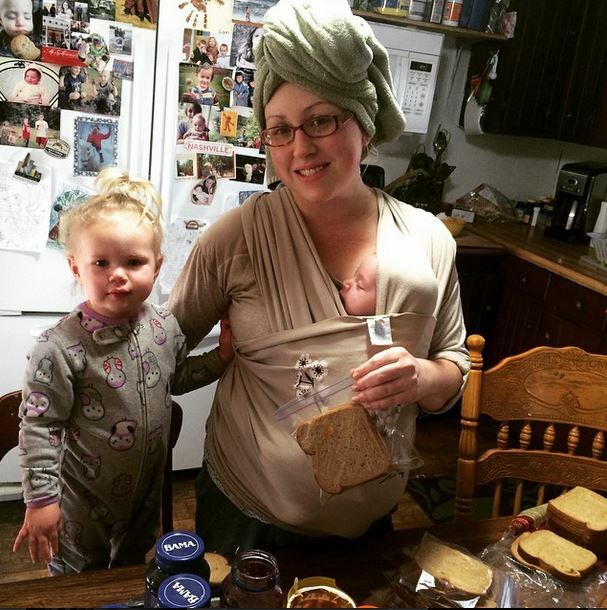 Miss Amelia at age two and brand new baby Daniel making 50 PBJs for the freezer a few years ago. I also precooked a lot of my ground beef and chicken for the month that I’d need for additional quick and easy dinners. I find it very helpful to cook meat in bulk up front. This way I can make the massive meat cooking mess once and be done. Because of my growing love for freezer cooking, it was so sad when our used full-size freezer died a little over a year ago. This didn’t stop me from freezer cooking convenience foods. I was still able to store everything we made in our 4-hours freezer cooking sessions (more examples linked above) between our three top freezers above our three refrigerators. But I longed for a fresh full-size freezer so I could prep many dinner meals in bulk once again. I was thrilled to get this beautiful new freezer in early May, finally. 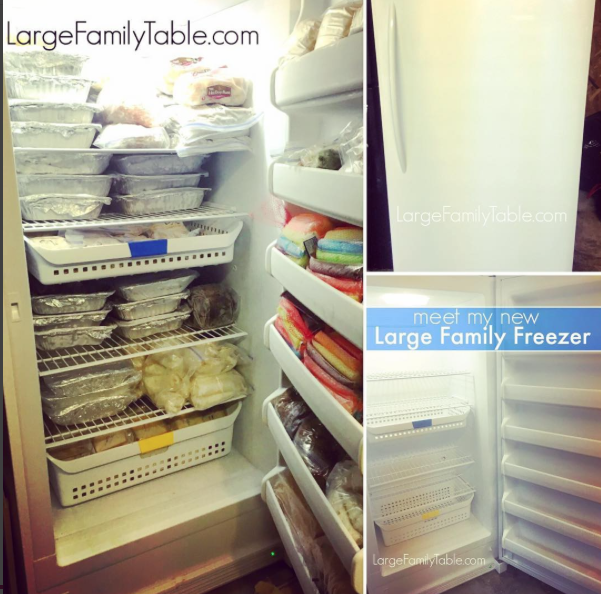 The new freezer, plus the fact that I’m having baby number eight very soon, along with how recently I’ve saved hours of my life with Walmart’s new grocery pick-up service, all added up to me finding a ton of inspiration to stock up on large family freezer meals. 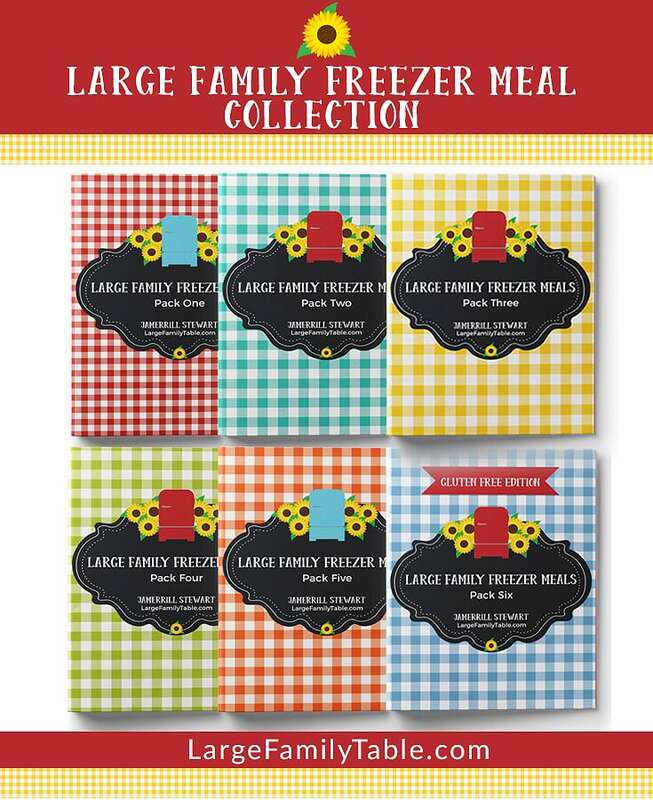 There are several different styles of freezer meals out there. 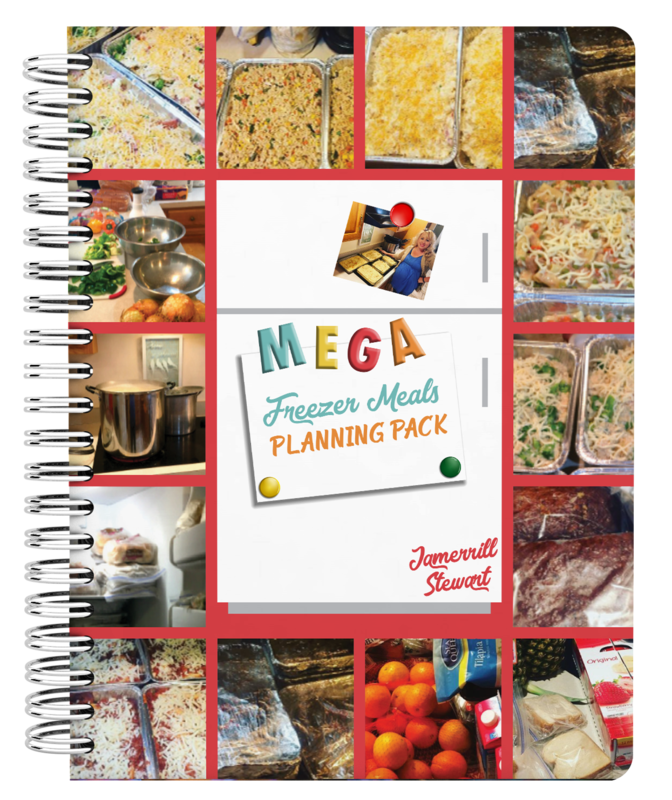 I also like to do slow cooker freezer meals, and I did a few of those this time. However, I focused heavily on easy casserole dinners for the freezer in these freezer cooking days shared below for the ease of my family. The slow cooker freezer meals generally require I set them in the refrigerator the night before or morning I plan to cook them. Then I dump the slow cooker meal in the slow cooker, turn it on, walk away, and serve at dinner time. Easy peasy. 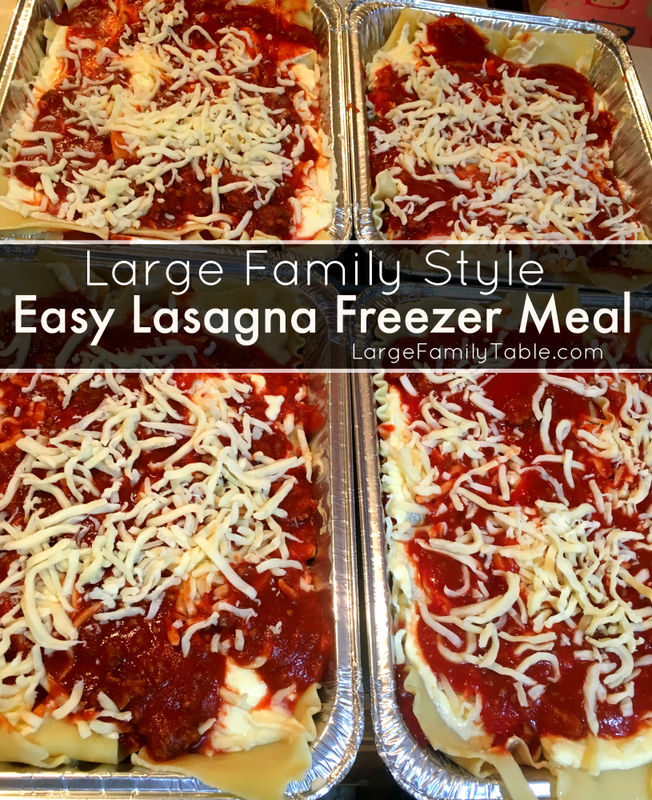 Easy Lasagna Freezer Meals – Large Family Style! For my family though, since I’m about to have a baby and will be out of commission, I wanted to make it even easier. 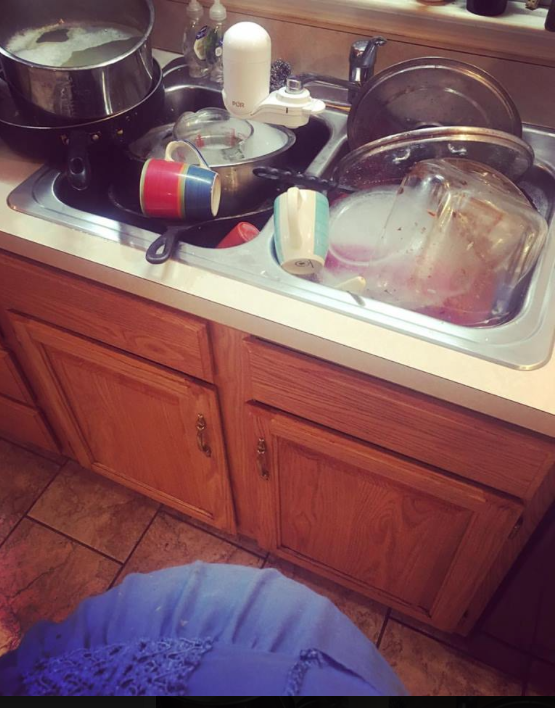 By having the meal completely done in a pan, all they have to do is put the meal in the oven, eat the meal at dinner time, and throw the pan away when they’re done. In my planning pregnant mind, it seemed like the best method for these freezer cooking undertakings. I joyfully shared all of my day one freezer cooking goals here on Instagram. I use my Amazon affiliate links for the Instant Pot, and Bread Machine below. Here’s my full disclosure policy. I was able to get the following completed and took at least an hour afternoon nap right in the middle of it all. 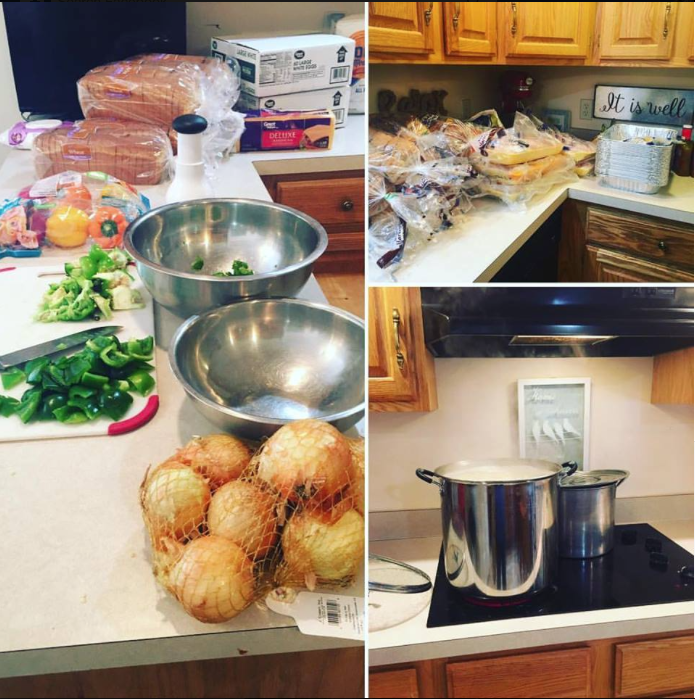 I used my Instant Pot, stove, bread machines, and oven to prep as much as possible. Our two teen boys got the following done plus both took a turn tackling the dishes and kitchen clean up. I shared on Instagram how things looked by the end of the night. That was our one last load, which everyone helped with the following morning. Momma couldn’t move another muscle. On day two I was able to get started a little earlier, and I had more consistent helpers. I had most of the food items prepped minus the various noodles. My three big helpers finished 50 more PBJs, 50 additional grilled cheese, 100 slices of french toast, and 70 more egg/cheese breakfast burritos. I assembled 5 Freezer Lasagnas, 4 pans of Baked Ziti, 4 Tuna Noodle Casserole, and 1 Italian Chicken for the Slow Cooker. I also bagged the remaining brown rice, chicken, hamburger, veggies, and beans. All of these are served with available various veggies, fruits, butter bread, applesauce, etc. Plus dinner prep ahead helps including 3-gallon bags of precooked brown rice, 5 lbs of shredded cooked chicken, 5 lbs of cooked Ground Beef, six packs of chopped veggies (great to throw in sauces, soups, chili, etc. ), and 2-gallon bags of pre-cooking pinto beans. All of these breakfasts are also served with fruit or yogurt as well. 100 Egg & Cheese Breakfast Burritos (8 Breakfasts for our family) – These break down to be about eight breakfasts for us over a month. We usually pack 12 freezer breakfast burritos per gallon freezer bag. 100 Slices of Freezer French Toast (4 to 5 Breakfasts for our family) – We pack these 12 to a bag as well. This makes for 4 to 5 breakfasts for our family because younger kiddos might only eat two pieces, but several will eat 3 or 4 slices. 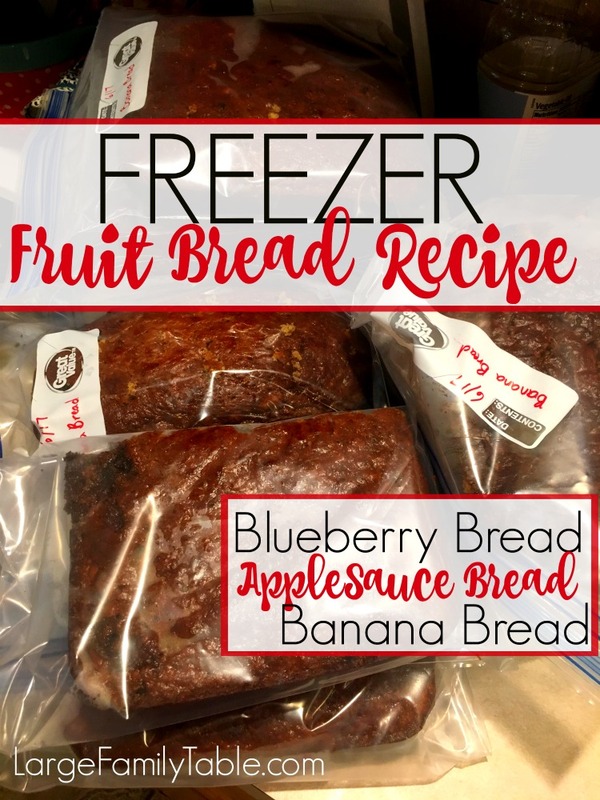 8 Loaves of Fruit Bread (8 Breakfasts for our family) – Freezer Banana or Blueberry (or any berry) bread is another helpful breakfast. I just set a loaf out into the refrigerator the night before. I can’t tell you how many times I breathe a sigh of relief as I grab a dozen PBJs from the freezer. Add along to that a bag of clementines or carrot sticks, and lunch is served. 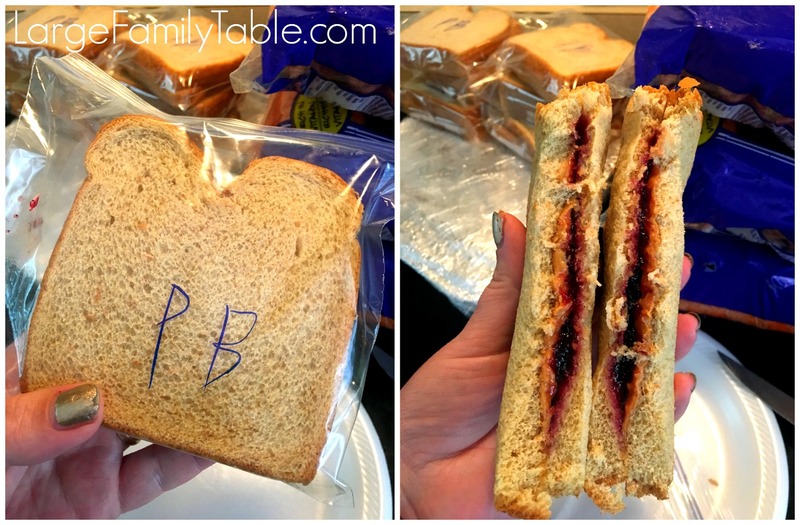 You can see here and here how I quickly add in these freezer PB&Js as needed into our large family daily meal plan. 100 Freezer Peanut Butter and Jelly Sandwiches (8-10 Lunches for our family). The picture below is of a defrosted Freezer Peanut Butter and Jelly Sandwich. I’m often asked if they turn out soggy. Hopefully, you can tell by the picture that they are not. 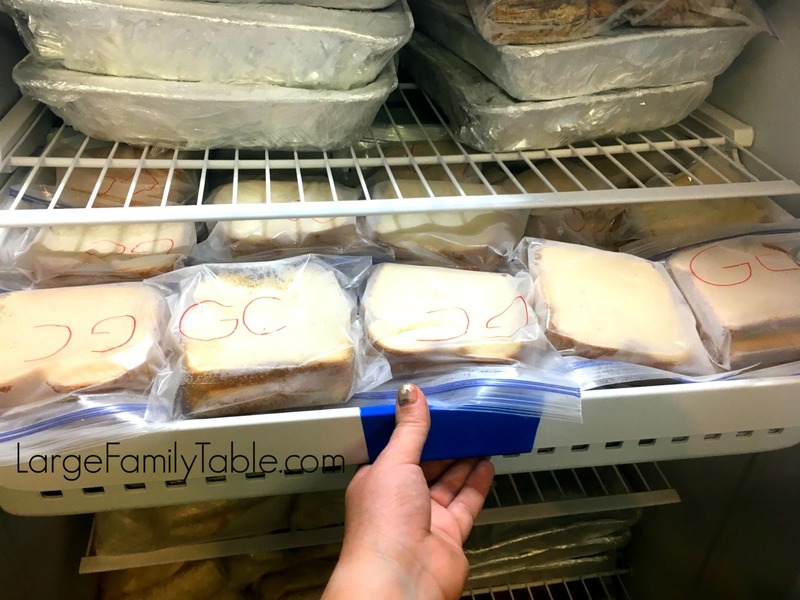 100 Freezer Cheese Sandwiches (to be used as grilled cheese) also 8-10 lunches for our family. Yes, crazy simple! Put two slices of cheese in-between two slices of bread. Place in plastic baggies and freeze. When you need to make 12 or 24 grilled cheese fast, quick, and in a hurry, just put your frozen cheese sandwiches in the heated stove pan or griddle and make your grilled cheese sandwiches as you normally would. We usually add butter to the outside of the bread right at grilling time. If youre interested, here’s my Amazon affiliate link for the two griddles I use here. I can do 16 at a time with these. Or for even more convience you can throw your grilled cheese in the oven! 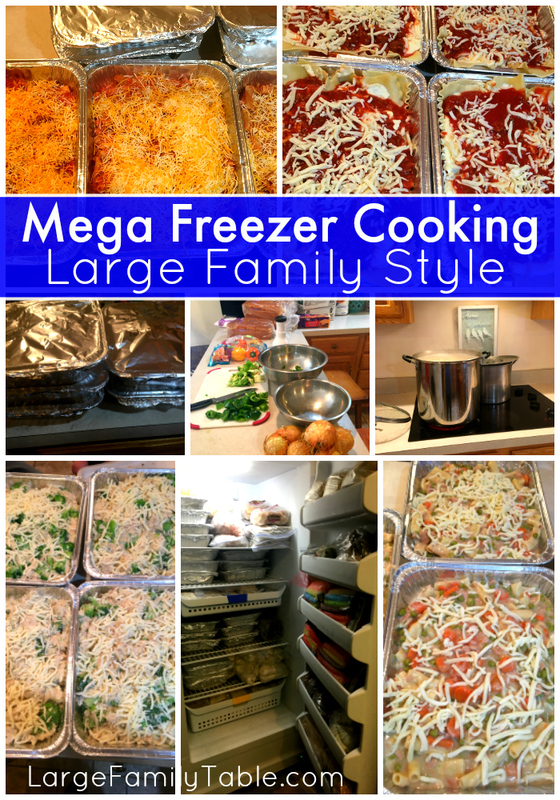 ?LARGE FAMILY FREEZER MEALS | Day One | ?Massive Freezer Cooking Meal Prep ? Click here to watch the full LARGE FAMILY FREEZER MEALS | Day One | ?Massive Freezer Cooking Meal Prep ? 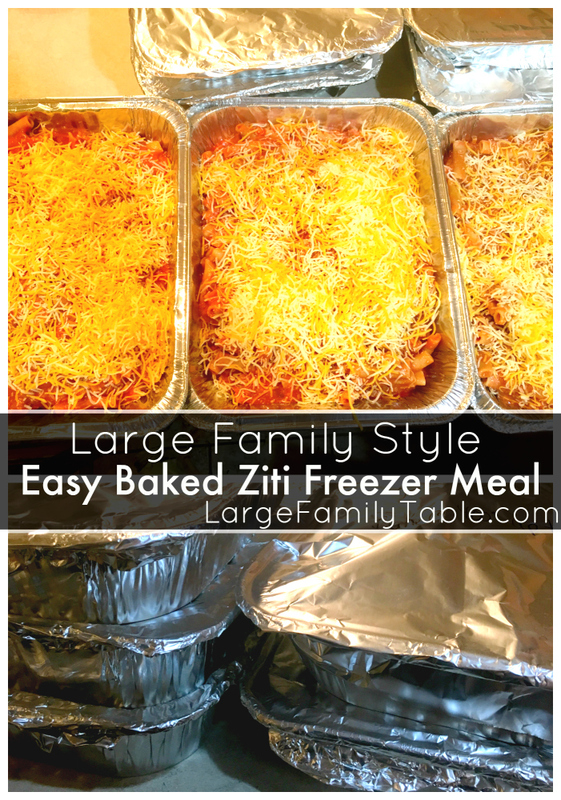 LARGE FAMILY FREEZER MEALS | DAY TWO | 26 DINNERS, 21 BREAKFASTS, 16 LUNCHES! 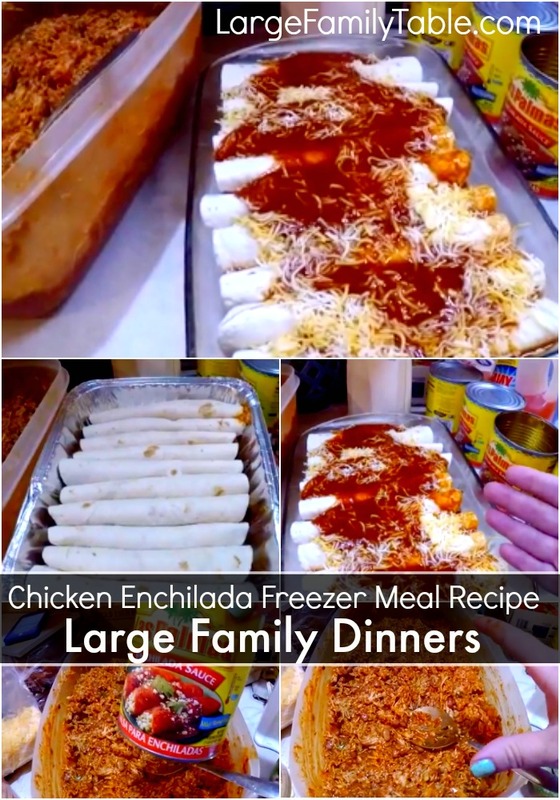 Click here to watch the full LARGE FAMILY FREEZER MEALS | DAY TWO | 26 DINNERS, 21 BREAKFASTS, 16 LUNCHES! Thank you for sharing I cant wait to try these meals. Wonderful! Let me know how they work out!! What is your method for preparing and freezing the French toast? We put the frozen french toast into the toaster & it turns out warm & crispy. I’m such a huge fan of yours! you inspire me with freezer cooking, it’s been a while since I’ve done any freezer cooking. How do you reheat the French toast? THANK YOU! I love batch cooking… It saves so much time and money. We do frozen ham and cheese sandwiches without mayo or mustard. I then buy the little packages of mayo and mustard. When we pack school lunches in the morning its grab freezer sandwich and mayo and go. We also do little bags of oatmeal for micro oats in morning.. reuse bags for next time. I usually do one baking day a week where I do about three family servings of a few things and extra goes in freezer this usually keeps things well rotated and I can use whats on sale each week. Plus you only have to drag out everything once a week instead of everyday.. letting you focus on other things rest of the week. Many times I’ll get quick company.. a freezer meal plus frozen bread machine rolls makes it quite easy and I don’t even need to mess up the kitchen! How much was the total cost to make all the meals?